We have a 50% interest in the Badr El-Din Petroleum Company (Bapetco), a joint venture with the Egyptian General Petroleum Corporation. Bapetco carries out field operations in the West Desert, where we have interests in the BED, NEAG, NEAG Extension, West Sitra, Sitra, Obaiyed and Alam El Shawish West concession areas. 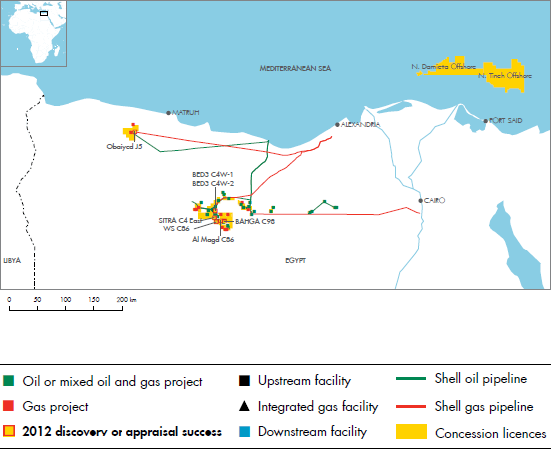 In addition, we have interests in two BP-operated offshore concessions: North Damietta Offshore and North Tineh Offshore.